Take a break after finally finishing your taxes and have the stress off your shoulders and joy brought on. On this hike we will hike the Red Oak Ridge trail at a friendly pace over to the Mud Pond trail and loop it back around. Please call to reserve your spot 24-hour advanced notice at 518-793-0511. Program fees apply. 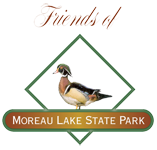 This event is free for members of Friends of Moreau Lake. Rating: Moderate to Advanced due to length and hills on the ROR trail. **Please note our rating system is based on generalizations and is not meant as a guideline for hikes everywhere. These ratings take into consideration not only terrain but distance traveled and are only comparative to Moreau Lake. Please call the park office for more information if you have any questions about hikes, 518-793-0511.